On reflection, I feel that the work I have created surrounding the Hidden City Brief is highly successful. I have been extremely out of my comfort zone when working on this project in a vast variety of ways and I feel that I have really pushed and challenged myself. I have always considered figures and the human form to be a weakness of mine when it came to drawing or painting them. When I had the City Brief, it seemed like an obvious opportunity to experiment with the figure and work on a project incorporating people to improve my skill. I have never really worked with photo-manipulation in this way before either and I have certainly never used my photo-manipulations to inspire paintings that I would create. I have worked with a variety of new methods including under-painting and working with grounds, and I feel as if I have learnt a huge amount, developed my skills and grown as an artist. I really thought about what I was going to base my project on and I feel that it really paid off. I feel that the Hidden Loneliness of City life is a highly interesting concept that is so relevant to today’s society. I started by experimenting with portraying loneliness through working with photography and manipulating techniques. I was highly inspired by the cutting out all of the figures from my photographs apart from one, to portray the feeling of being alone in the city even though you are surrounded by others. I thought about the fact that all the other people in the city may as well not exist or at least might as well just be white silhouettes and I started working with paint and illustrating these ideas on board. Attending the paint workshops on a Monday has been an incredibly valuable use of my time and allowed me to work with new techniques and painting methods. I think my painting skills and knowledge has definitely been heightened. In my opinion, there are quite a few successful elements to this body of work. The amount of experimentation I have done and how much I have learnt and progressed because of this is undoubtedly a success. I think all my paintings are successful in their own right because they have all taught me something. 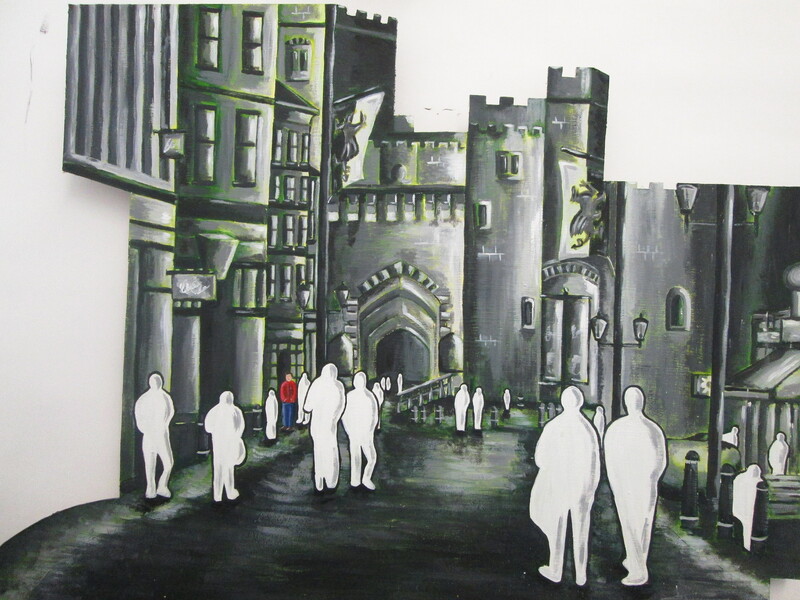 I worked with a sepia colour scheme and experimented with the scale of the people and use of background, because of this I came to the conclusion that monochrome was more effective in highlighting a feeling of loneliness than sepia and so I started experimenting with monochrome painting. This informed one of my final pieces and I definitely feel that it is only a successful final outcome because of the prior experimentation. 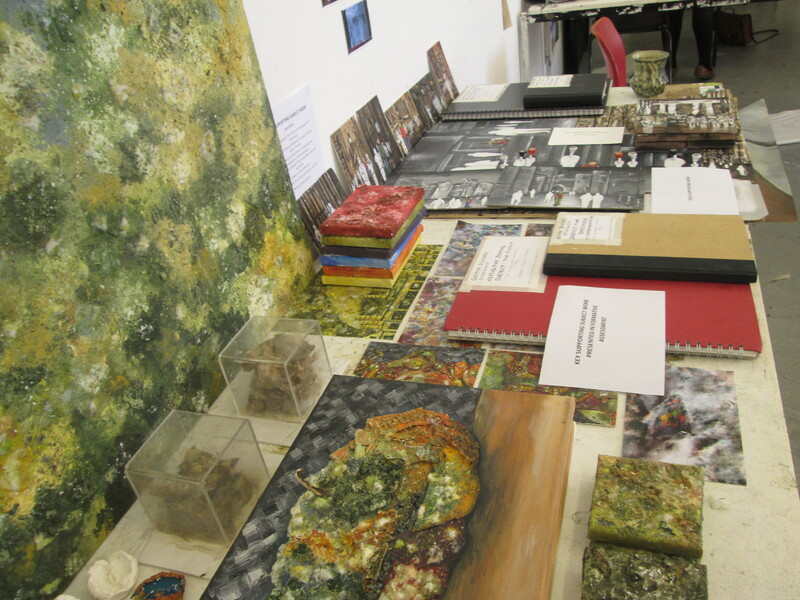 One element I feel is particularly successful is my consolidation of the work I produced and how I have linked it in to the work that I produced as part of the collaboration group with other students. I think that including stop motion animation into my project portraying loneliness was the most fitting way to link in what I have learnt through collaborating with my peers. Stop motion animation has turned out to be the perfect way to showcase the photo-manipulations and tracing paper experiments that I have been producing throughout the project. I feel as if I have successfully created a body of work that has a deep concept and portrays the fact that you can be surrounded by others in the city but you may as well be alone as you rarely interact with anyone. I also feel I have accurately shown how you may as well be invisible to others in the city and that you are singled out which heightens people’s feelings of loneliness. However, there have obviously been things that haven’t really worked within this project which I feel I have quickly moved on from. 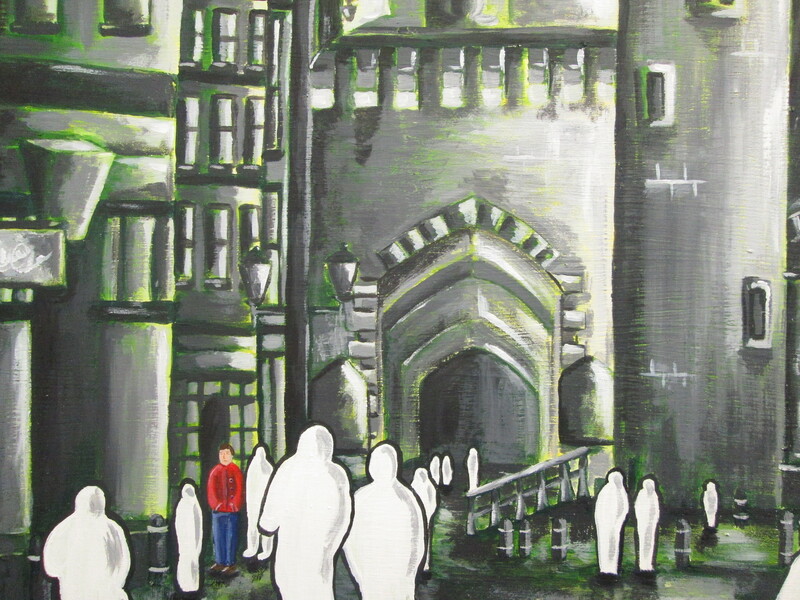 For example, I attempted to show loneliness through bright colours but it didn’t really work. The art looked far too cheerful and I quickly pushed this idea to the side. Also, I don’t feel that working with a palette knife was a success as it detracted from the concept and the figures in my opinion. Finally, even though the concept of headphone beings was interesting, Looking back, I don’t think that the outcome is particularly successful. I think it looks quite unprofessional and amateur. In conclusion, overall I feel that this project has been a success. I have challenged myself, experimented widely, practicing drawing and painting figures and learnt many new skills and approaches to art. I feel I have managed to demonstrate the hidden loneliness of city life and visually portrayed the fact that in the city you can be surrounded by many others but still feel so alone. It has been an incredibly interesting subject to research and create art work in response to. I will definitely notice others more in the city and make the effort to smile and make conversation with people because I know how lonely they might feel even though there are many members of the public around them. I have decided to submit my monochrome shaped painting that I started within the last fine art project session as a final piece. 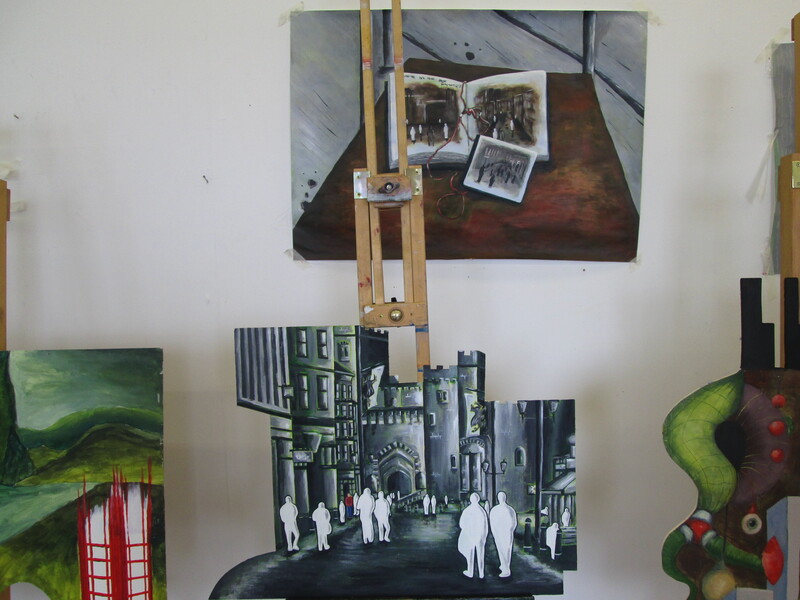 It communicates all of the material skills that I have learnt throughout the painting project and accurately consolidates my body of work surrounding the hidden loneliness of life in the City. Participating in the project has taught me a wide variety of skills, I had never explored the technique of underpainting before and I learnt how much an underpainting really can inform a final piece. I also acquired a knowledge of dry brushing and allowing an underpainting to come through the top layer of paint. Creating a shaped painting was a new and interesting concept for me as well as like many other painters, I tend to traditionally paint on square or rectangular surfaces. I wanted my final piece to convey all of the skills and knowledge that I have gained from attending these sessions and I feel that this monochrome shaped piece with a green sort of under glow definitely does. Previously, I experimented with making the people the focus in my work rather than the architecture and making the buildings more gestural. Like I said, I do think that this was highly successful, but in this piece, I think the buildings really add to the feeling of loneliness within the work because of the eery and sort of uneasy green underglow that is coming through the monochrome overlay. I employed the technique of dry brushing within this piece so that the green underpainting is really a valued part of this final outcome. I feel this piece really consolidates my city project. It portrays everything I have learnt, the things I have progressed with, the things I have not taken any further but learnt from and the meaning and concept behind my take on the city itself. 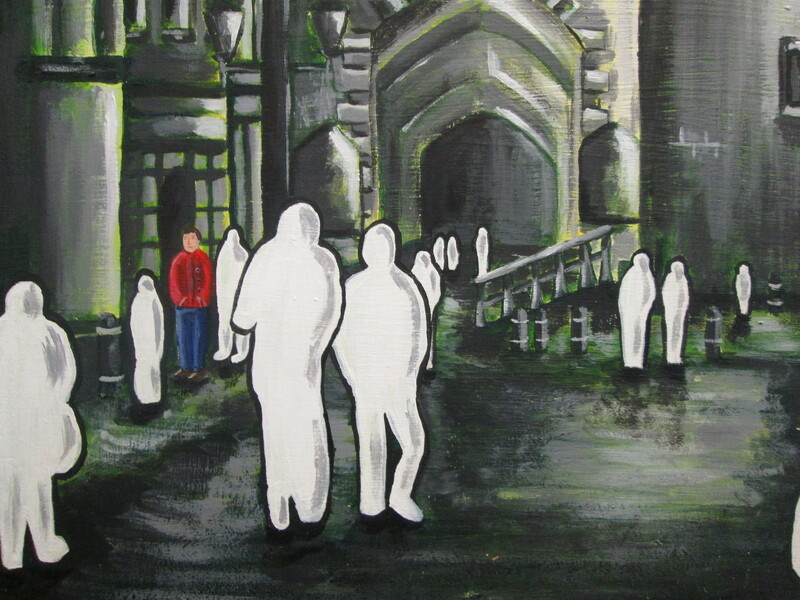 I have included a coloured figure surrounded by white silhouettes within this piece because it has been my most successful portrayal of being surrounded by others in the city but alone. You might as well be alone in the city because no one interacts with you or notices your existence. You may as well be surrounded by bodies with no defining features – white silhouettes. I definitely feel that it is worse being around people and being made to feel alone in the city than actually being around no one. 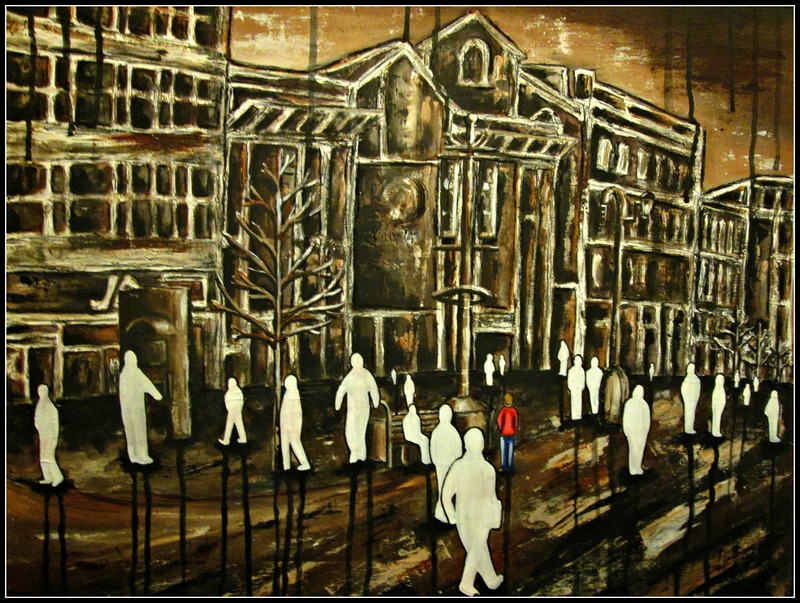 This piece represents how you are alone in the city regardless of being surrounded by others and that if the only people you see all day are the passers-by of the city, then your time in the urban environment can be an incredibly lonely, with no interaction or conversation with others. 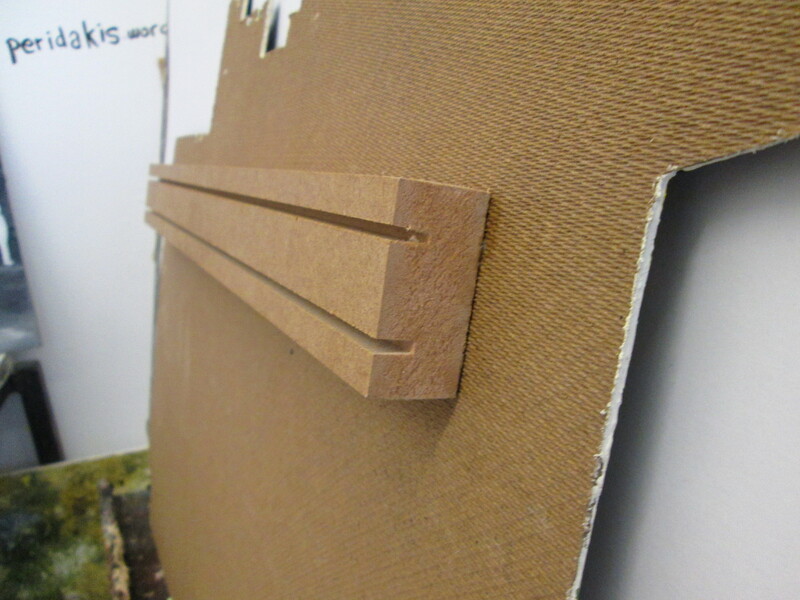 As this is a final piece, I thought about the fact that it should be able to be presented and hung on the wall as a final outcome and so fixed a block of wood to the back of the board so that it can be hung upon nails or screws. I definitely would not have made this piece without attending the painting project sessions, they have been extremely valuable to me and even though I have had to create a final piece based on what I have learnt in these sessions, I think I would have made a piece inspired by them anyway because of how many new techniques and methods I have worked with. Underpainting is definitely something I am going to be considering in the future as I feel it has really informed and added to the outcome created here. 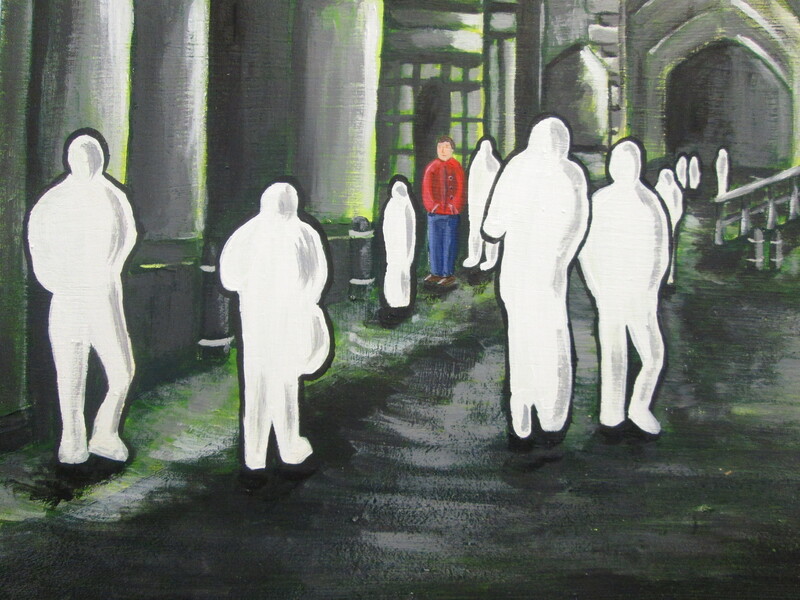 I think this piece is highly successful in portraying what I have learnt in the sessions as well as highlighting the hidden loneliness of City life and how you are alone and a singular figure in the city even when you are surrounded by others. I am incredibly happy with and proud of this final piece. It is definitely not something I would have usually created but that has taught me that experimenting with new styles and techniques can make for highly successful outcomes. 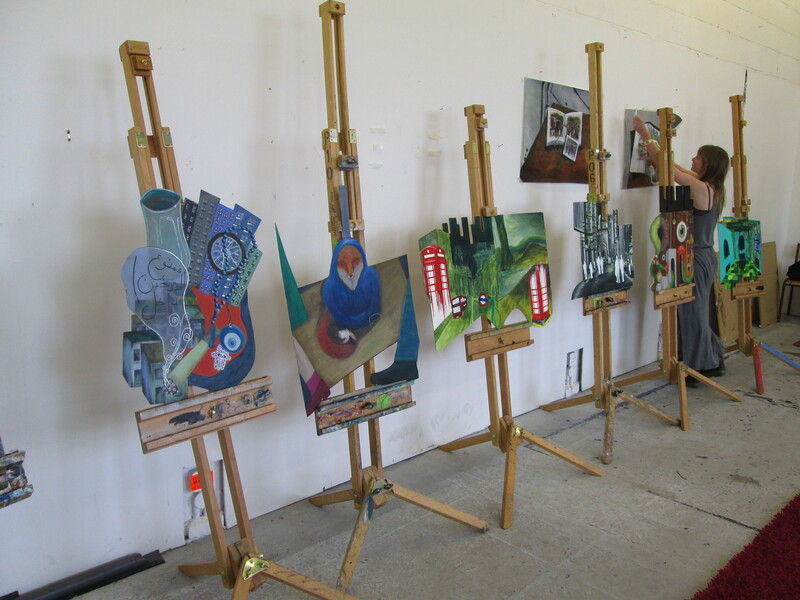 In the first hour, we were given the task of putting the final touches to our shaped paintings in preparation to informally exhibit what we have created within these sessions to our peers that have been working in other discipline sessions within fine art. I am incredibly pleased with my shaped painting, so much so that I am thinking of presenting it as one of my final pieces. I think the green glow coming through the monochrome is quite eery and heightens the feeling of loneliness within the painting. I have spent a lot of time working on this and I feel it definitely shows, I was really excited to exhibit this piece along side the shaped paintings of the other members of my painting group. It was really interesting to see how each of us had approached the task of creating a shaped painting very differently. All of the pieces had our own stamp on them and were painted in completely different techniques. Some people had completely covered the green underlay, some had let it show through as I have. It was fascinating to me that we had all been given the same brief and interpreted in very varied ways. 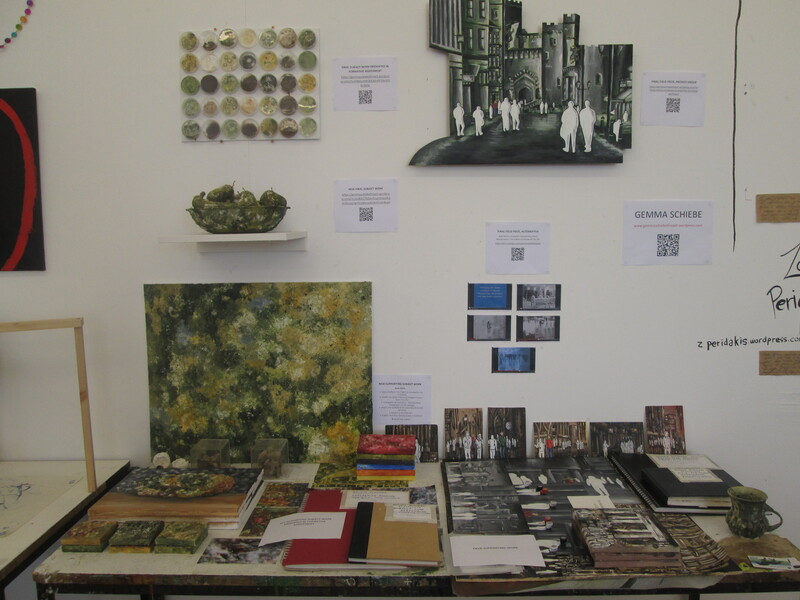 I think presenting all our work as a mini exhibition was a great way of consolidating all that we have learnt the past weeks and the perfect opportunity for each one of us to take a step back and look at what we have achieved. 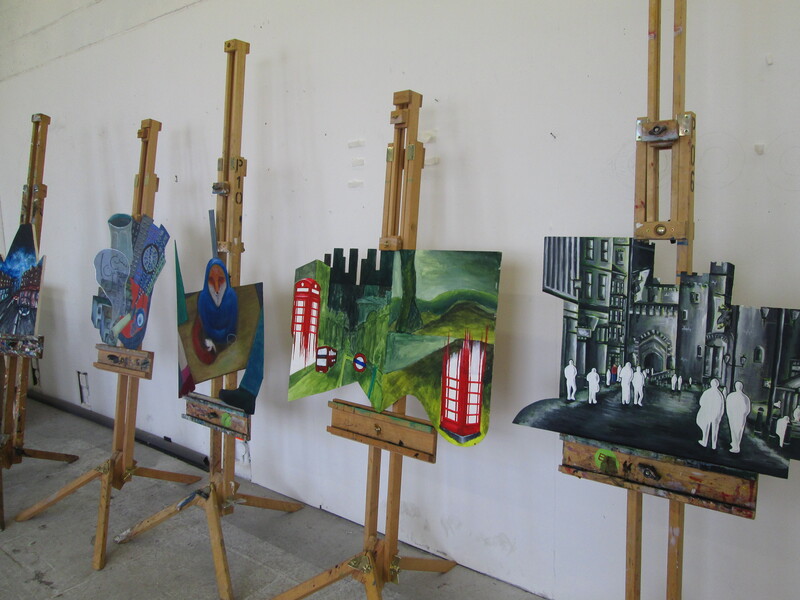 I have really enjoyed attending these painting sessions on a monday and I have learnt a massive amount. 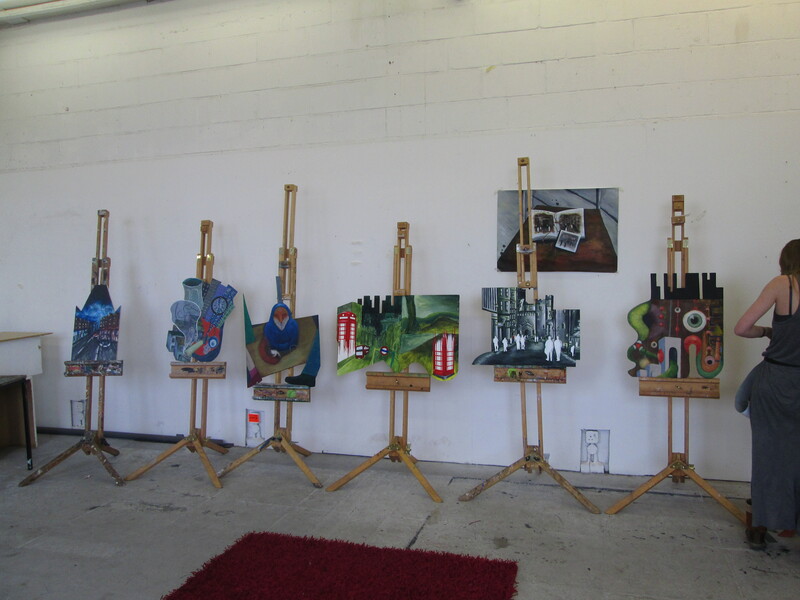 I had never experimented with green underpainting or dry brushing or creating a shaped painting before and I have acquired valuable skills that will continue to influence my work and that will stay with me through the rest of my artistic life. 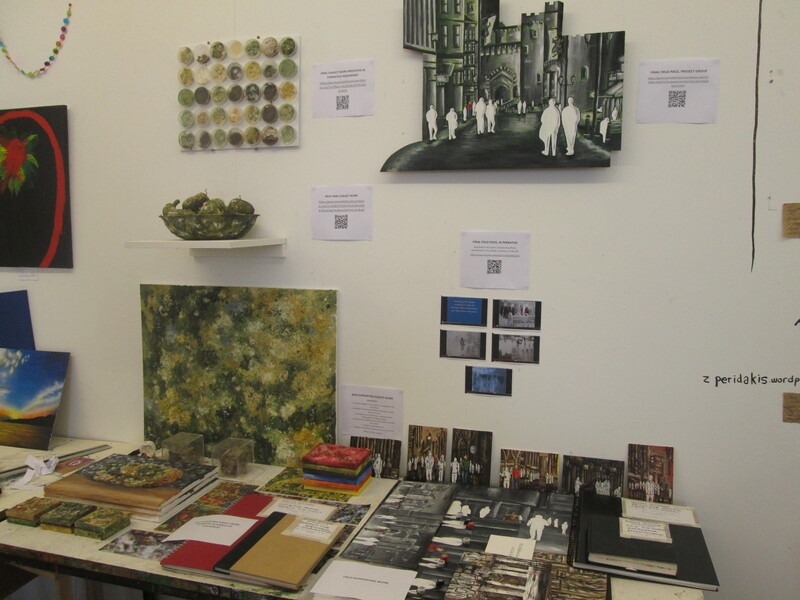 I am very pleased with the body of work that I have been producing relating to the City. I feel like I have an interesting concept, exploring the Hidden Loneliness of the City and have experimented with this idea in depth. 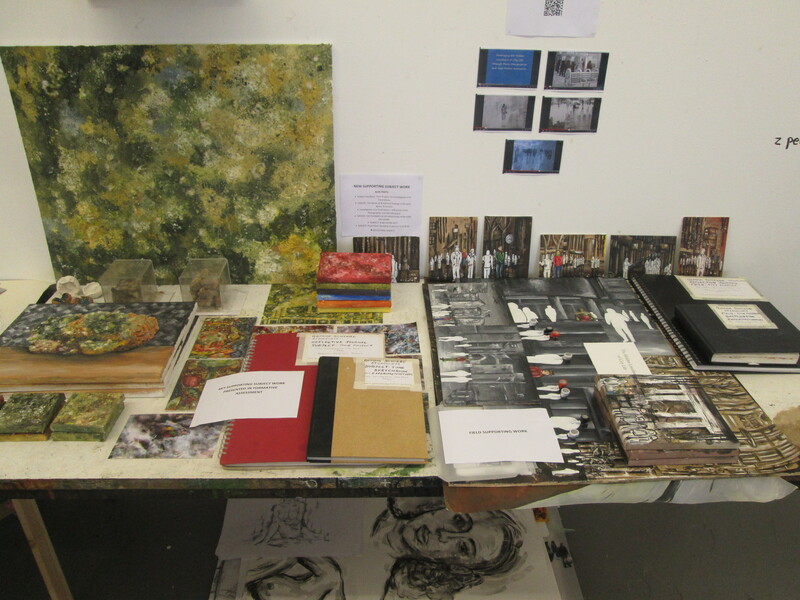 However, I felt like I needed to consolidate my findings and portray what I have learnt and think is working so far. I decided to make a piece reflecting on these findings. In this piece, I have incorporated a variety of different medias including paint, ink, charcoal and gouache. I have portrayed the sepia tone influence that I have been working with inspired by an artist I came across in Berlin and user Shoe 18 on the deviantart forum. I started off with a dark brown ground here, influenced by my experimentation after undertaking the grounds workshop, I also painted an underpainting using a palette knife and worked on top of this employing Dry Brushing techniques that I learnt from attending the paint workshop sessions with James Green. 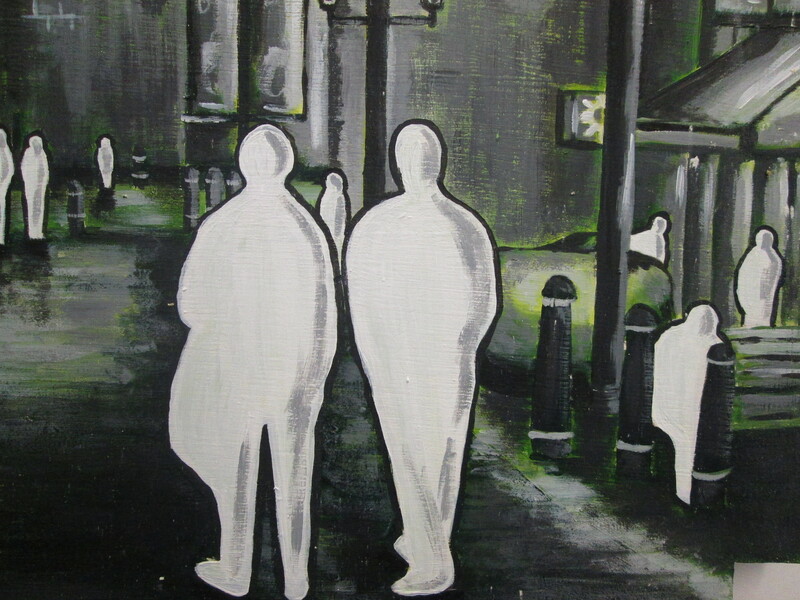 I have worked with the concept of all of the people around you being insignificant and portrayed that they are just bodies and may as well just be white silhouettes because I believe it is particularly successful and left one person in colour to show they are lonely and singled out among all the others that they do not interact with. I wanted to formulate a piece that includes all the experimentation and things that I have learnt that I believe have been positive and successful within this project. I believe this is an accurate reflection of this and a successful piece of work in itself. Now that I have consolidated and reflected, I feel that I can move on in my project with confidence and continue my experimentation. After my tutorial on Monday, I realised that I haven’t experimented with monochrome because I was so inspired by the influences of the artists I mentioned, but this is what I will be working with next, I believe that the loneliness may be heightened by an empty monochrome background and the colours of the one person will appear more vibrant and therefore the person will stand out more. This seems like it will progress my work further and add to the portrayal of the Hidden Loneliness of Cities. 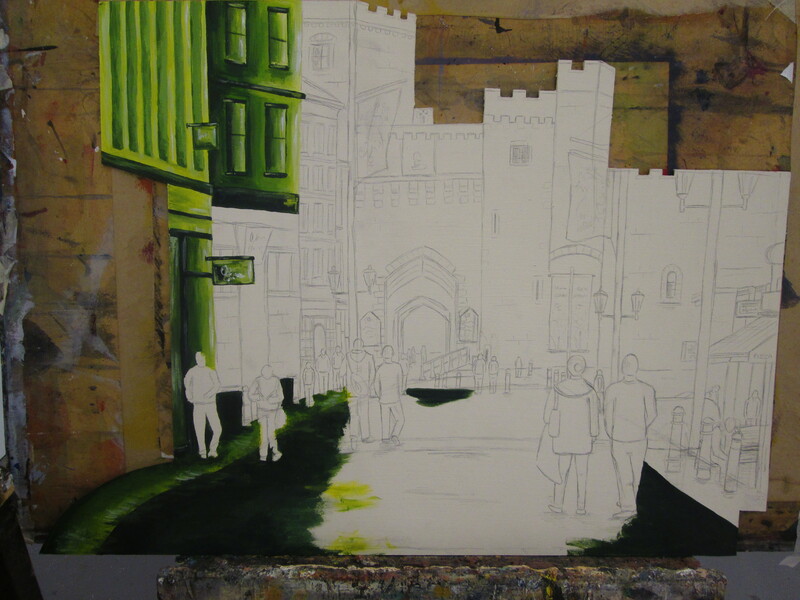 I have started working on the green under-painting of my shaped piece that I started in Mondays paint workshop. When I previously produced a green under-painting of a still life, I found that the tones I had worked with in the green underlay really informed the shadows and highlights that I painted when rendering the top coat. I found that I produced a far more three-dimensional and tonal outcome and that it was easier and quicker to do as I had already thought about tonal variation in the under-painting. In this shaped piece, I am taking more time on the under-painting and focusing on achieving dimension and tone within it. Also, I was really surprised by how well the green showed through my work when applying the top layer with a method of dry brushing and so this is something I will be working with again. 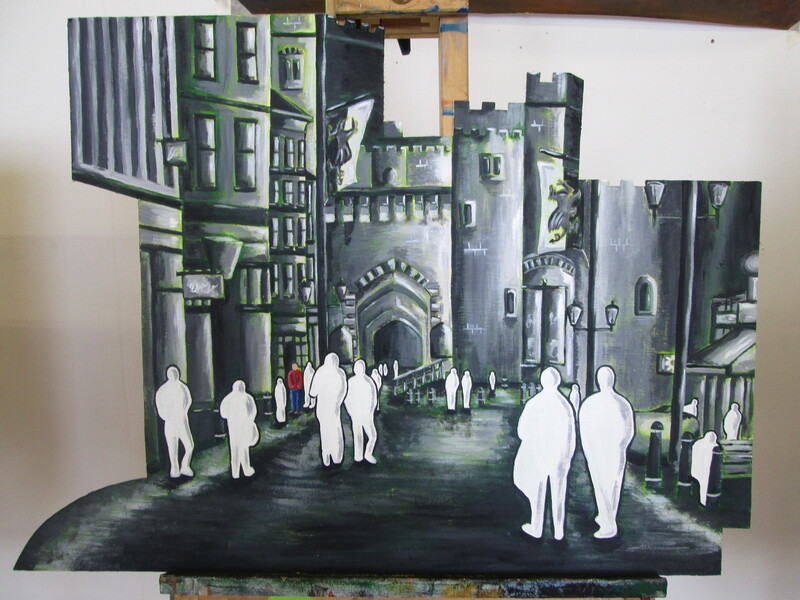 I will document the progress of this painting and work hard to create a highly successful outcome portraying the hidden loneliness of the city. I will incorporate the white silhouette imagery I have been working with into this piece and work at creating a visually successful piece. 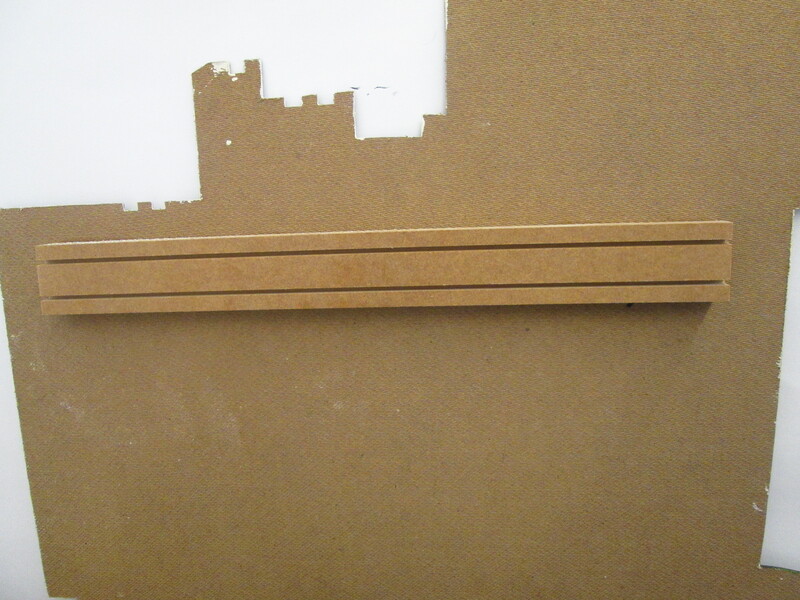 I have never made a shaped painting, but I can see how it is going to make for an interesting outcome already. I am really enjoying the paint sessions and have already learnt many valuable skills that I have already started applying in my project work.